Cathedral in the Desert - a little tough to get to, but worth the climb. Hole in the Rock - what a view. Getting to watch a water plane take off - exciting! A stormy day on the lake is pretty dramatic. 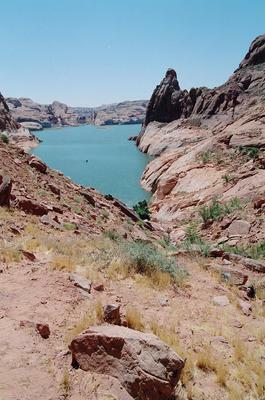 My first experience on Lake Powell was with my husband's family for a week on a houseboat. Spending a week with 20+ members of a new family is a bit daunting, but after just a few days, it was like I had been a part of the family for years! 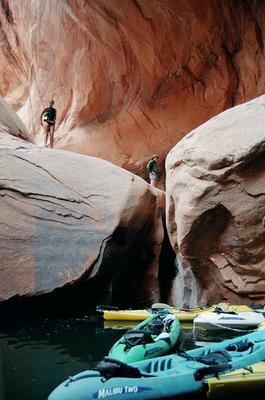 Part of that had to do with just plain great people, but the other part had to do with Lake Powell itself. What a beautiful place to get acquainted! 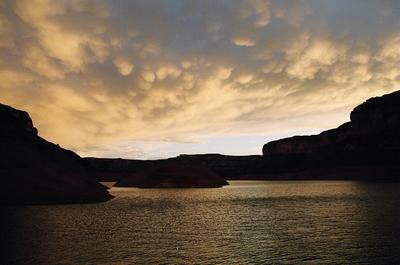 From sun up to sun down we explored the endless beauty that is Lake Powell. Swimming, jet skiing, kayaking, climbing rocks and hills and then once the day is done, lying there gazing above you at the breathtaking night sky. That week went by much too quickly, and it just made me more anxious to the next time we'd get to be together in that magical place!! Join in and write your own page! It's easy to do. How? 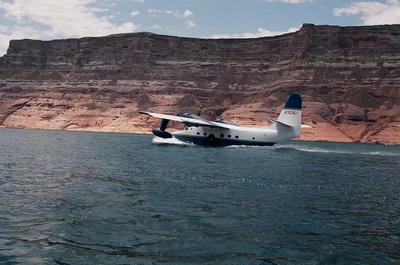 Simply click here to return to My Most Memorable Lake Powell Vacation.